Brown Brown: The New Citizen! 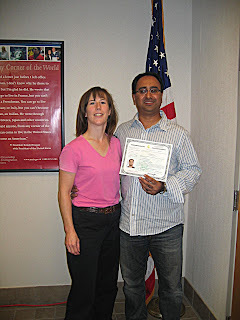 As of 10;00AM today (October 16, 2008), I am now a US citizen. I have been living in the USA for about 15 years and decided that it was about time that I got my citizenship. The whole process took about 15 months from the time I applied in July 2007. I took my test on Tuesday (Oct. 14, 2008) and my oath this morning in a private ceremony. By the end of the day, I have registered to vote and have applied for my passport. It has been an overall great day today!